Hello hello, friends! Happy National Soft Serve Ice Cream Cake Day! I know some of us are ready to say goodbye to summer, but noo, please let's just hold on, guys! Well, I have to admit that I have been occasionally craving cooler nights and crisp walks outside, but today being soft serve ice cream day just begged for a soft-serve-inspired, creamy, crunchy, swirly, pastely, whipped-creamy ice cream cake finished with Sweetapolita Soft Serve Twinkle Sprinkle Medley (obvi)! I've called this creation the Strawberry Sundae Ice Cream Cake Supreme. The best part about making ice cream cakes is that you can get super creative and honestly you can't go wrong! My littlest cakelet, Neve, helped me with this one, and we had so much fun just going through the cupboards looking for yumminess to stick in this thing haha. So let's talk about what ended up inside this frozen delight! Okay, so...I went for it. The cake is 4 layers of strawberry-ness filled with all sorts of textural and swirly goodness! 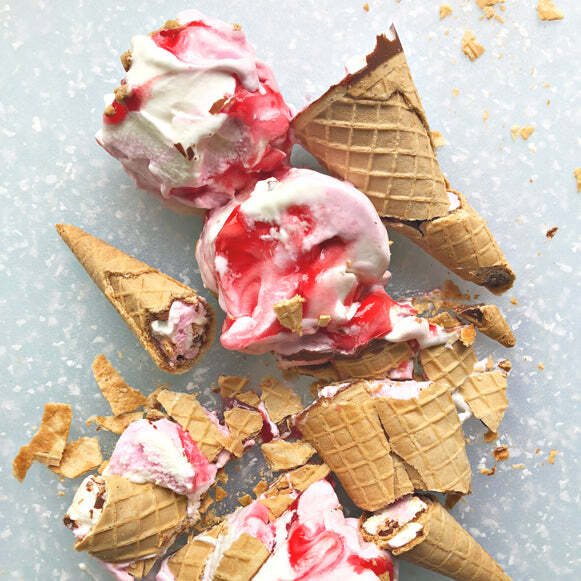 Let's take a closer look: The base layer is bubble gum ice cream softened by some hand stirring with a wooden spoon, and then filled with chopped Strawberry Cheesecake "Drumsticks" and then a heap of crunched up waffle cones... The next layer is softened strawberry ice cream topped with slices of, um, coconutty, jelly-and-whipped-cream-filled Billot Logs (the very Canadian childhood treat, that I happened to see these at the grocery store and, while I don't normally buy this kind of packaged dessert, they were perfect for this!). I'd love to know the American version of these, because there must be? If you know, fill me in? :) Then we have our vanilla-bean ice cream layer swirled with strawberry preserves and strawberry sundae syrup and, well...topped with pieces of Strawberry Pop Tarts. You guys! The last layer is another vanilla bean swirled-jelly version topped with artisan oatmeal cookies (I say that to be accurate, but honestly I think any good old-fashioned oatmeal cookie would do the trick). These are yummies I chose to include, but just remember you can use almost anything your heart desires for this ice cream cake! Think of it as a super-sweet, girly, casserole, hehe. These Soft Serve Twinkle Sprinkles are my current favourite for so many reasons. Just so delicate and sophisticated. Perfect for the girliest of occasions or, well, the ice-creamiest of cakes! Yay, yay, hooray! This pink Whipped Cream Frosting is so dreamy and easy. (You might remember it when we made the Birthday Party Ice Cream Cake!) It's just stabilized whipped cream, which means it won't melt away before your eyes, the way regular whipped cream does. The clear gelatine gives it a stability for piping and lasting a few days. Okay let's make this Strawberry Sundae Ice Cream Cake Supreme!